Oak Crest originated with the goal of providing an academic science research environment accessible to participants spanning a broad diversity of educational levels; high school to post grad. 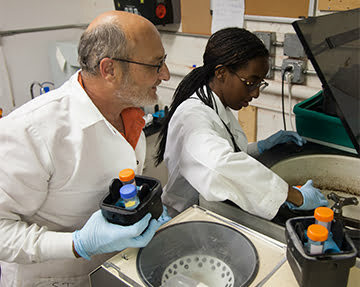 It was the vision of Dr. Marc Baum, Oak Crest’s founder, that a small, intimate research institute could be highly complementary to established large institutions of higher learning in conducting rigorous, productive, relevant science research while broadening the participation of underrepresented groups (by race, ethnicity, gender, and socio-economic standing) in science. Three years after its 1998 incorporation this vision solidified; Drs. Baum and Moss (Senior Faculty, joined the Institute in 2001) started the first research program at Oak Crest that served community college students exclusively. Since then, programs have been added, some expanded, the number of staff tripled and the facility size has grown to match. Oak Crest continues to prosper thanks to invaluable contributions by researchers, from volunteers up through senior faculty, and through the generous funding support from government, foundations, industry, and private donors. Findings published earlier in 2015 in teh prestigious journal Antimicrobial Agents and Chemotherapy report that a novel, subdermal implant delivering potent antiretroviral (ARV) drugs developed by Oak Crest scientists shows extreme promise in stopping the spread of HIV. The report received extensive, international news coverage, including a special feature on Crown City News, a Pasadena-based news station. Oak Crest hosted its 4th Annual U19 (NIAID NIH Award Number U19AI113048) meeting on May 9th and 10th, 2018. Colleagues and friends from Johns Hopkins Medical Institute (JHMI), Vanderbilt, UTMB, UCSD, UCLA, Scripps, the Miriam Hospital, and CDC arrived on Tuesday May 8th and attended a casual reception and dinner at 38 Degrees Ale House in Monrovia. Wednesday’s activities were held at the Arboretum, which provided a natural and inviting setting for talks on grant-related topics. Peacocks could be heard chiming in with their approval. The Lime Truck provided excellent eats accompanied by Jim Jediken’s jazz quartet at Oak Crest for the evening social in our lab’s parking lot. On Thursday everyone moved back to the Monrovia Canyon Cabin to continue the meeting. The cabin is located in Monrovia Canyon Park which is on 80 acres of beautiful hiking trails, a waterfall and a nature center. Some participants took advantage of the setting and could be seen taking a hike on the trails during the lunch break. The views expressed are those of the Oak Crest Institute of Science and its leadership and do not necessarily reflect the official policies of the Department of Health and Human Services (HHS), nor does mention of trade names, commercial practices, or organizations imply endorsement by the U.S. Government. At first the event seemed more like a family reunion than a scientific research meeting. Chemists, microbiologists, medical doctors, and postdoctoral researchers from across the United States greeted each other like old friends as they gathered for the third annual U19 meeting supported by the Integrated Preclinical/Clinical Program for HIV Microbicides and Biomedical Prevention (IPCPMBP) of the National Institute of Allergy and Infectious Diseases (NIAID), part of the National Institutes of Health. Hosted by Dr. Marc M. Baum, president and senior faculty of the Oak Crest Institute of Science, the three-day annual meeting was held on May 3-5, 2017 in and around Oak Crest’s new hometown of Monrovia, CA. The third annual U19 Meeting focused on the research, testing and efficacy assessment of a novel pod-intravaginal ring (IVR) capable of delivering one or more potent antiretroviral drugs with the goal of preventing HIV acquisition in women. Funding for this five-year grant project was awarded to Oak Crest in 2014 under the Integrated Preclinical Clinical Program for Microbicides and Biomedical Prevention (IPCPMBP), a grant (U19 AI 113048) that funds collaborative projects through the U19 cooperative agreement mechanism involving multiple institutions. The first full day of meetings took place at historic Santa Anita Park, a thoroughbred racetrack in Arcadia, CA, just 10 minutes from the Oak Crest facilities. With its backdrop of the San Gabriel Mountains, it is considered by many to be the world’s most beautiful racetrack. The day was filled with “big picture” scientific presentations updating the team on progress made to date since last year. Day two took place at the Monrovia Canyon Park Cabin/Conference Center nestled in the hills above the city. This scenic venue sits on 80 acres with trails, a waterfall, lush vegetation and local wildlife. The tranquil, isolated location was perfect for more in-depth scientific talks by select project team members on specific accomplishments under the auspices of the Program. After nearly 12 months of intense work, monthly teleconference meetings and hundreds of emails sent back and forth across the country, team members on the National Institutes of Health (NIH) grant (1U19AI113048-01), were able to gather in person for the first time to discuss progress on this groundbreaking research project. Hosted by Principal Investigator, Dr. Marc Baum, president of the Oak Crest Institute of Science, the first IPCP (Integrated Preclinical/Clinical Program) Annual Meeting was held July 15-17, 2015, in Pasadena, CA. The meeting brought together key personnel, Project and Core Leaders, and other stakeholders to review Year 1 activities on the grant project and to discuss activities to meet Year 2 specific aims. “This was truly a unique event,” said Dr. Baum. “Our young scientists at Oak Crest, many of whom have not even finished their college degrees, had the chance to converse with top notch researchers from some of the most prestigious institutions in the country. They were able to discuss groundbreaking advances in drug formulations that are urgently needed to overcome inadequate disease treatment and prevention in the developing world. Where else would they have this type of amazing opportunity?” commented Dr. Baum.